The Godlyke Power-All PA-9B is a 2000mA, single-outlet power supply designed specifically for guitar effects users. Don't waste money on batteries or take up valuable space with multiple "wall wart" adaptors or power bricks-the Power-All system can power your entire pedal board from a single outlet. The Power-All Basic Kit can power five guitar pedals out of the box. It provides 9 volts DC at 2000 milliamps, which is more than enough current to power dozens of effect pedals, including up to 3 Line 6 modelers. 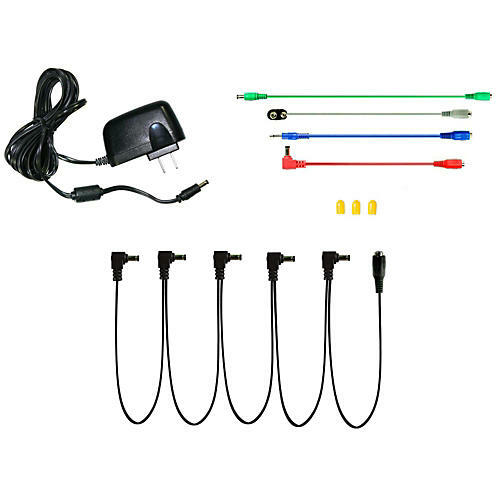 The Power-All Basic Kit comes complete with a variety of jumper cables that allow connection of phone plug, reverse polarity, digital, and battery-only pedal types. The Power-All's special circuit design produces extremely low noise. A ferrite-core filter on the power output cable aids in reduction of noise and hum too. The power cable also automatically converts any input voltage to 9 VDC, allowing the Power-All power supply to be used anywhere around the world. Built to stand the rigors of the road, it features professional-grade construction and comes with a lifetime warranty. Please note: a misprint on this product's packaging gives a power rating of 1700mA. The correct specification is 2000mA. Cable-5/R five-connector right-angle Daisy Chain with spring-loaded jacks for extra secure connections ” no more losing power mid-solo!